I have just completed making a Sailing Rig for my canoe. I am planning to take it to the Lakes at Easter. I made the Thwart, Pole and Sail. I realise that I could have bought all of this but I wanted a challenge. I know it's only a flag sail but if it saves me paddling on the downwind leg it's a bonus. I hope to make a leeboard this weekend. Good luck with the first sail. On my inaugural sail with my home made rig the rudder fell off the canoe and I fell out of it. ! making stuff yourself is so much better as you have an insite as to affect repairs and possibly any improvements. You have made a good job with that. I particularly like the thwart and mast foot. Good luck with the tests. Where in the Lakes are you planning to go, maybe we will see you. I am most pleased with the thwart, it was the easiest to make.Just cut, drill, route, sand and varnish a plank of wood. 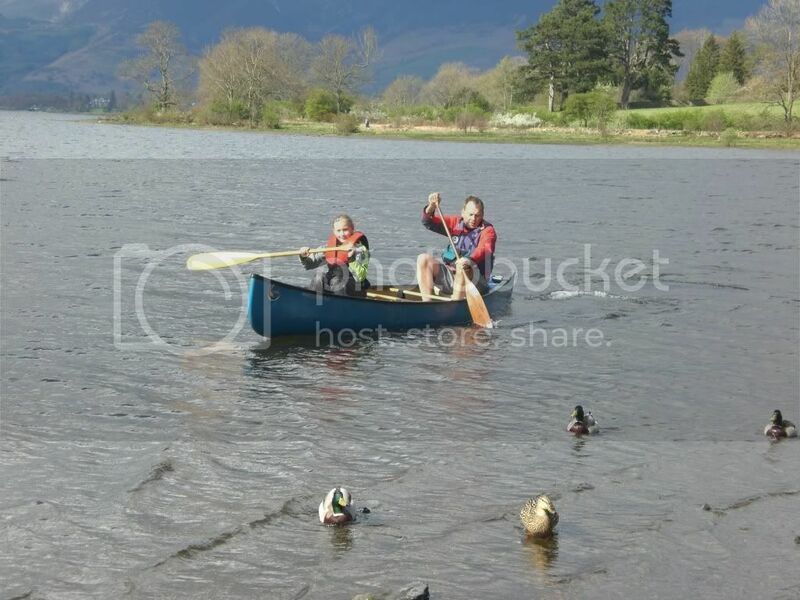 We are camping near Keswick next week and plan to put in on Ulswater. I have thrown together a rough Leeboard to try sailing into wind. If it works I will make a better version when I get back. That looks as though it will work. How thick is the plywood. If it is only 1/4inch it may break in stronger winds. You make a good point, it probably is only about 1/4"
I have another piece the same size so I will glue them together. I dont think I will be sailing it in high winds, my wife doesn't like going out of her depth! The leeboard can get a lot of force on it and should be anchored firmly. A good plan is to attach it to the mast thwart, so the wind and water forces cancel out without passing through the hull. A steel bolt at least the same diameter as the thickness of the board makes a good pivot in my experience. Later you may want to look at one of the leeboard threads for information. We spent last week in The Lakes. 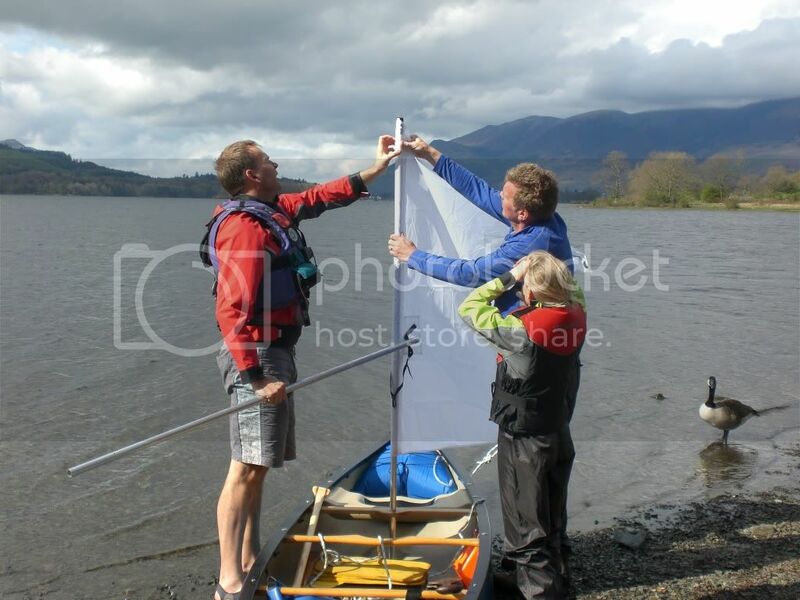 We then tried Derwent Water later in the week and I tried the sail. We had to paddle back! I think this was partly to do with the poor lee board (it kept floating upwards) and the sail shape, or rather lack of it! The sail is too small for upwind progress, it has to overcome the drag of the wind on the boat and occupants, as well as create enough speed to overcome leeway. 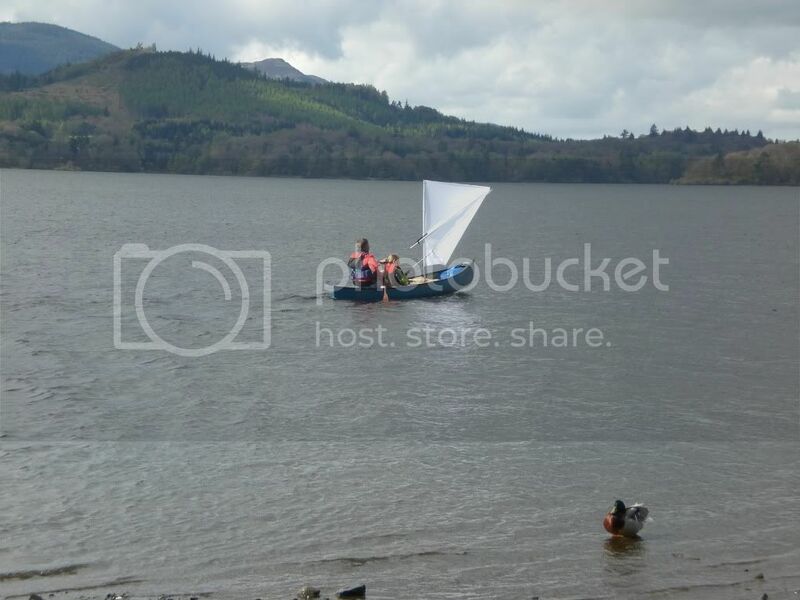 I found with a sail area about 4x that of the boat and occupant I could do no better than sail back and forth across the wind; that was a 12 sq ft sail on a kayak and that boat and occupant is much lower in the water than is the case for a canoe. I think about 20 sq ft for a solo kayak and about 35 sq ft for a canoe are the minimum, and the sail would need to be efficient. Sitting low down in the boat also helps. Leaving all that aside, isn't it a great feeling to have the breeze waft you along in virtual silence? 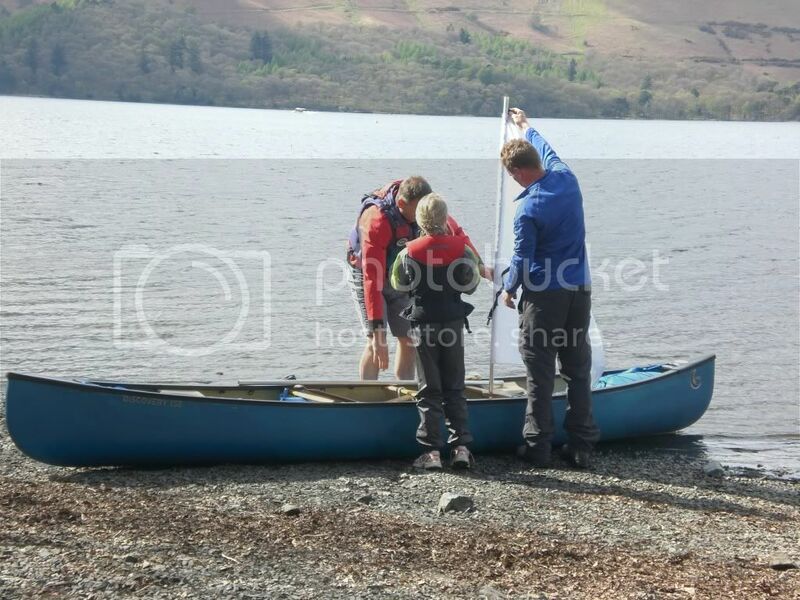 Problem is, a big sail on a canoe can be scary if you're not athletic. I tried a sail on a canoe a long time ago, with a float on an outrigger. First time out the mast snapped about 30 seconds into the trip, which taught me how much force the wind can provide. It didn't go very quickly and there was a lot of gurgling from the float. Then one day the water noise stopped and the canoe accelerated to a speed I never achiewved paddling. I looked around to see what was different and there was the float about a foot above the water. That told me all I needed to know about how good my float design was! 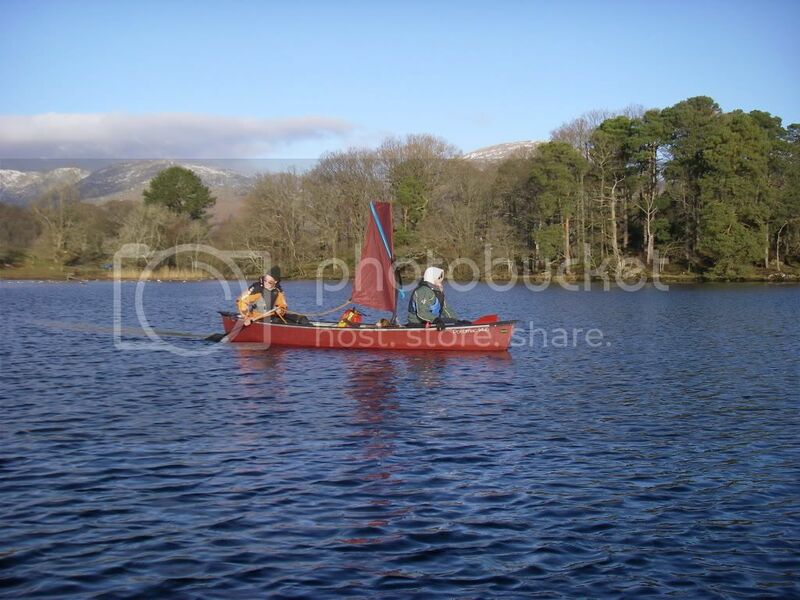 Agreed, I am happy just to use the sail down wind, that will halve my paddling on the lakes. Whilst we were all out on Rutland at the weekend I spent many hours paddle sailing: confirmed what I always thought, that sailing is best across / into the wind! Downwind paddling is fun: the wind is helping you along, and on a good reach the waves build up and eventually give you the chance to surf... even if it's just for a few feet at a time! By and large, it's possible to fly along without too much effort. Sticking a sail up renders paddling un-necessary, but unless you're out in VERY strong winds, you are moving in the same direction as the wind... which reduced the "apparent wind". Travel downwind at 5 mph in an 8-10mph wind and you'll barely notice the wind at all... and paddling doesn't make you go any faster or make the sailing any more fun! Now turn around with something like the new Solway Dory Expedition Rig: paddle at 3-4 mph INTO that 8-10 mph wind and the apparent wind speed actually INCREASES, making the sail become more efficient with every paddle stroke - and before you know it, you're flying up the lake with comparatively little effort and at a rate that you couldn't match even paddling vigorously with a tandem partner! I think my favourite image of the Rutland weekend was seeing Greg and a little later Dave Stubbs paddle sailing my little Apache with its Expedition rig upwind at a great speed in relatively light or moderate winds and keeping up with or exceeding the speed of the 44' Bermudan rigs. It was good to see how efficient paddle sailing can be. I'm pretty sure I was outdistancing the 50 square foot bermudans and the 58-60 square foot ketches when I was paddle sailing... though my best turn of speed all weekend was probably in Dave's boat: 35 square foot expedition rig in the front, 25 square foot in the stern.... and paddling as well - despite light winds, that setup was really shifting! The shape in the sail seems to be critical: I've enjoyed playing with assorted sails... but none of them have been flat... and all have had to be properly supported: the problem with the downwind flags, apart from the lack of shape, is the lack of support - those square sails need spars top and bottom, not one across the diagonal! The expedition rig uses three equal length spars to make stowage in the canoe easier: if you want to do the same thing with poling poles, I've pretty much worked out how it could be done... but you'd need a third pole (ideally longer) to really make it work - though that has the advantage that you can stow the sail by furling it around the spare stick when not in use, which is better for the sail than being folded (or stuffed in a bag). Ps. Grand to see you, though you scarpered pretty smartish: I was up and looking for the hammock pretty early on!